When visiting Andalucia, I would highly recommend making the trip to Ronda. The winding roads up the mountainside can be a little daunting, but what a view all the way to the top! 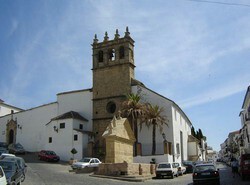 Ronda is one of the oldest cities in Spain, having origins in the Neolithic age. Wonderful cave paintings were discovered, including the famous Pileta's Cave, depicting paintings from the Paleolithic age. Its mountain top location made it an ideal location to build a city - very easy to defend. The first builders were the Romans, and many examples of their architecture can still be viewed in the city today. The Moors then made their mark, and built the walls, gates and arches of the city, which are still very much intact. You can stroll alongside the walls, enjoying the fabulous views… or visit the Arab Baths, still in an excellent state of repair. State protected because of historic interest in 1931, these baths were built at the end of the 13th century or start of the 14th century. Another fascinating building to visit is the Casa del Rey Moro - or House of the Moorish King - which appears to be from the 18th Century. The house itself is in a dilapidated condition, but the first floor has been restored, and contains the tourist office. Well worth a visit to the gardens of the house, which were constructed by the great French Landscaper Forestier in 1912. The house also has a mine which you can visit, which consists of a wide zigzagging staircase carved into the rock, covered by a fascinating system of stacked vaults. Visit the Sala del Manantial (Room of the Spring) from which slaves brought water to the King. The hub of Ronda is the "New Bridge", that divides the city, over a deep gorge - El Tajo, with houses literally hanging on the edges of the cliffs. Right next door is the lovely Alameda del Tajo Park - perfect for a restful stroll after your busy sightseeing, and also the Blas Infante viewpoint where you can stand on a balcony over... a huge drop! Famous people love this city - close to the Alameda del Tajo Park, you can visit the Paseo de Orson Wells - the famous actor loved Ronda and is, in fact, buried there. Ernest Hemingway was also very fond of the city and the Paseo de Hemingway has been named for him. He visited Spain during the Spanish Civil War, to report for the North American Newspaper Alliance. The Plaza de Toros, or Bullring, of Ronda, is the oldest in Spain and was officially inaugurated in 1785 by the two bullfighters, Pedro Romero and Pepe Hillo. It is possible to visit the bullring, its museum and the surrounding buildings and paddocks. 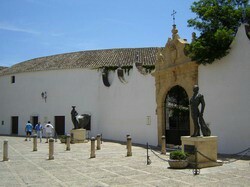 Outside the entrance to the bullring are statues to two famous bullfighters of Ronda, Cayetano Ordonez and Antonio Ordonez. Strolling the streets of Ronda is like taking a step back in time - narrow streets with attractive buildings, tapas bars and restaurants - and wonderful shops. You will also come across interesting museums, like the Museo del Bandelero… lots of beautiful churches and lovely plazas and sidewalk cafes to rest and catch your breath. It is difficult to mention all the wonderful attractions of this city in one article, but this is definitely a must-visit part of your Spanish tour! One little warning - try and stay a minimum of 3 days, otherwise you'll miss out on a lot of the attractions. 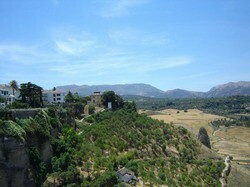 Wear good comfortable walking shoes, and if visiting in summer, always carry a bottle of water.. it gets hot in Ronda! 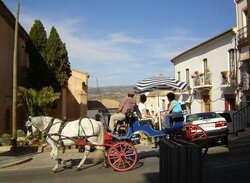 Anne Sewell is involved in web based accommodation reservations and advertising in La Cala de Mijas, Spain. Visit Global Travel Articles to read more travel information or to submit your own travel experiences as travel articles. A slideshow of the Arabic Baths in Ronda. State protected because of historic interest in 1931, these baths were built at the end of the 13th century or start of the 14th century. Probably the most important arab baths in the city and very well conserved under the sediment from the river until discovered in the mid 20th Century and carefully restored. 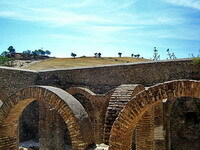 The photos are of the historic Arabic Walls and Gates of Ronda. The old part of Ronda was built, for defensive reasons, on a high rocky plateau, with the river to its North, West and East sides, and was further protected by a series of defensive structures, particular on the most vulnerable southern flank. The cliff's edge and the double layer rampart walls protected the enclosed space where a bustling Moslim community thrived. Casa del Rey Moro - or House of the Moorish King - of which the earliest evidence appears to be from the 18th Century. The house itself is in a delapidated condition, but the first floor has been restored, and contains the tourist office. 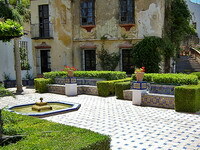 Well worth a visit to the gardens of the house, which were constructed by the great French Landscaper Forestier in 1912. The house also has a mine which you can visit, which consists of a wide zigzagging staircase carved into the rock, covered by a fascinating system of stacked vaults. Visit the Sala del Manantial (Room of the Spring) from which slaves brought water to the King. 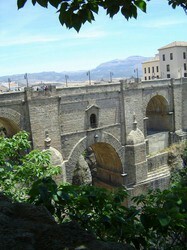 The Mountain City of Ronda - The New Bridge, the Gorge and Alameda del Tajo Park. 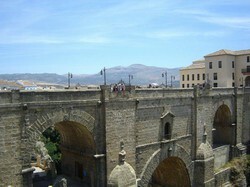 The hub of attraction in Ronda is the "New Bridge", stretching over the breathtaking gorge that divides the city. Right next door is the lovely Alameda del Tajo Park - perfect for a restful stroll after your busy sightseeing, and also the Blas Infante viewpoint where you can stand on a balcony over... a huge drop! Visit the Paseo de Orson Wells - the famous actor loved Ronda and is, in fact, buried here. Please note that these photos are copyright © All Spain Accommodation.